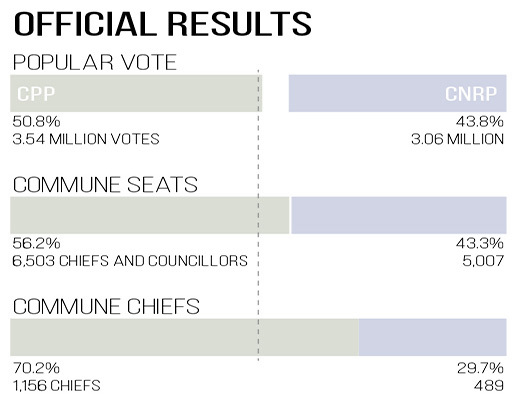 The country’s election authority released its official results for the June 4 commune elections on schedule on Sunday, calling 1,156 out of a total 1,646 communes for the CPP, which also won 6,503 of the 11,572 council seats up for grabs. The CNRP picked up 489 communes along with 5,007 commune seats, according to the National Election Committee (NEC). The Khmer National United Party, which split from the once-influential Funcinpec last year, won the last remaining commune and 24 seats. The results are close to the 1,158 communes the CPP called for itself just after Election Day, and followed recounts that saw some communes swing from the CPP to the CNRP and vice versa. The share of the popular vote for the CPP and CNRP also changed little on Sunday: 50.8 percent and 43.8 percent, respectively. “This is a huge victory for the Cambodian people and for the development of Cambodia, in accordance with the principles of liberal multiparty democracy,” he said. Though the ruling party lost several hundred communes to the CNRP, whose parent parties—the Sam Rainsy Party and Human Rights Party—only won a combined 40 communes in 2012 just before merging, CPP spokesman Sok Eysan was happy to accept the official results. The opposition, however, joined by several independent election observers, has been less than enthusiastic about the vote. While they have mostly praised the NEC’s running of Election Day, claiming far fewer irregularities than in past elections, thanks largely to a cleaned-up voter roll, they say the vote was still heavily marred by the conditions leading up to voting day day itself. Mr. Rainsy was pressured to leave the CNRP earlier this year by recent amendments to the Law on Political Parties that give the government the power to suspend and dissolve parties led by anyone with a criminal conviction. He lives abroad to avoid jail time for convictions widely seen as politically motivated. The charges that have jailed several CNRP lawmakers and activists, human rights workers, and an NEC official are also deemed politically motivated by many. “The political situation has made the election atmosphere not free or fair,” Mr. Sovann said. When asked whether the CNRP would accept or dispute the official results, the spokesman declined to give a straight answer. Speaking to opposition supporters on Sunday in Prey Veng province, however, CNRP President Kem Sokha called the results a “victory” that put the party in a strong position to win next year’s race for control of the National Assembly and, with it, the government. At a news conference in Phnom Penh on Saturday, a group of local NGOs that dubbed itself the Situation Room called the election a “significant improvement” in voter registration, voter list management, candidate registration, polling and vote counting. Its own estimates of the results, based on the 17,600 polling stations it observed from a total of more than 22,000, strayed from the NEC’s official numbers by only fractions of a percent. But like the CNRP, it said it would not call the elections free and fair. “No severe election violence was observed or reported during the election. However, significant irregularities or issues occurred prior to the election which established a context that negatively impacted the fairness of the vote,” it said in a statement. It blamed political suppression, the amendments to the political parties law, opaque campaign finances, biased courts, the intimidation of NGOs and military officials who openly stumped for the CPP. Before the vote, Defense Minister Tea Banh threatened to “smash the teeth” of anyone who dared to protest the election results. Prime Minister Hun Sen repeatedly warned of a return to war if the CPP lost and said he was prepared to “eliminate” hundreds of people to keep the peace. “These problems combined to result in significant limitations on the quality of the poll, such that elections in Cambodia cannot yet be considered fully free and fair,” the NGOs said.